Owning a pet is filled with moments of pure love and joy, but it also comes with tough moments. Saying goodbye to a terminally ill pet is definitely one of the hardest things! There is nothing more scary than discovering that our pets are seriously ill.
A few days ago, I received a text from my friend Cheryl, her senior dog Bella was feeling unwell. A trip to the vet provided devastating news: Bella was diagnosed with kidney failure and the prognosis wasn’t very good. When I learned the news my heart just stopped. Bella was one of my beloved fosters dogs, and when I told my friend I wanted to offer my help in any possible way she said “If we get lucky and I have her for a bit more, I would love some pictures of her”. I absolutely love photographing senior dogs and I always recommend people to photograph their pets before they get too elderly or sick. But life surprises us sometimes, so I try to make these sessions a priority. After our conversation, we quickly scheduled a time to meet and we decided the perfect location for a photo session was a park in North Vancouver, that they frequently visit. Bella came rolling in her stroller along with her senior brother Brutus, they both looked warm, snuggly and cozy. From the first moment that she came into my home as a foster dog I thought she was not only ridiculously cute, but also full of love. Now her joy and huge personality will live on in photographs, and I hope these images make her mom smile during the difficult times ahead. We spend about an hour together, after I finished photographing her I had a chance to snuggle with her. I’m not sure if she remembers me or if she knows she spent a few months with us but I certainly know she felt loved at that moment, and it reminded me that being with our aging and ill pets to the very end and providing them with the care, comfort and affection they deserve, is the least we can do that even comes close to the unconditional love and emotional support that our canine companions offer us on a daily basis. I always tell people: Pets are family — photograph them as often as you can! but with the shock and heartache of a terminal diagnosis, documenting your furry family member shouldn’t be something else to be stressed about. That’s why I offer the “Remembrance Sessions”. It makes my heart full that I can provide owners with wonderful portraits to remember their furry family members and cherished keepsakes that will last long after their beloved pet is gone. The grief, emptiness and sadness one feels during the loss of a pet can be profound. I remember feeling stunned for weeks when Frank, my first pug, crossed the rainbow at the age of 14. I know portraits of your pets can help providing a lasting connection, those memories will make you look back and smile making the grief process and the transition a little bit easier. 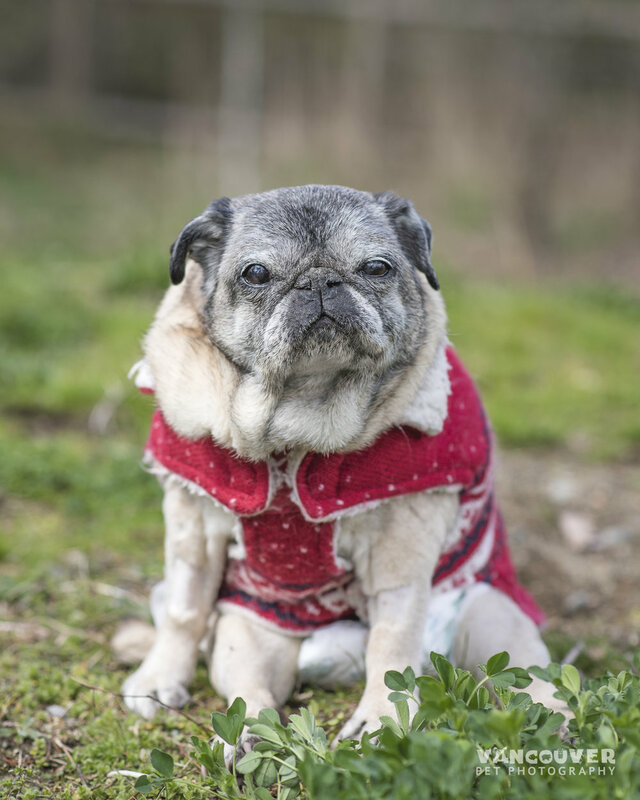 We’re not sure how long this precious girl is going to be around for, now the best prognosis is months… what I’m sure is that Bella you are very very loved, and will always have a special place in my heart!